i Click 'view all' to instantly compare this fantastic deal with offers on other top knife sharpeners. 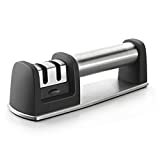 PriorityChef Knife Sharpener for Straight & Serrated Knives is currently selling at $13.95, approximately $1.02 lower than average, giving a potential saving of $2.00 right now. With a lowest price of $13.95 and an average of $14.97 it is selling on the low end of its usual range. Price volatility is 0.3% (meaning it does not change often), so the price should stay low for a while. Right now this product is a recommended 'fantastic deal'. There is a coupon available for an additional 15% off. The current deal is also the best price on this item over the last month. Compare the current price, savings (in dollars & percent) and Buy Ratings for the top Knife Sharpeners that are closely related to PriorityChef Knife Sharpener for Straight & Serrated Knives. Here is how PriorityChef Knife Sharpener for Straight & Serrated Knives compares with other leading Knife Sharpeners. 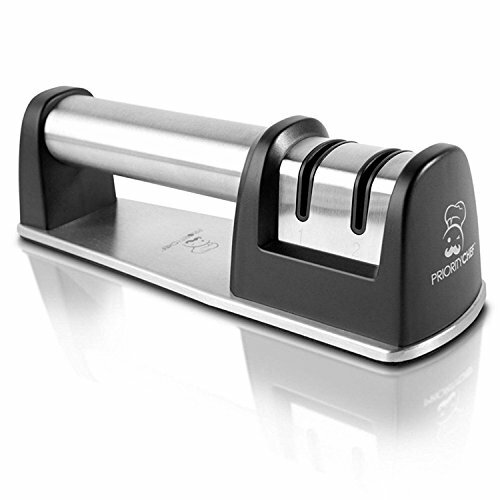 When you purchase the Priority Chef knife sharpener today here are some of the great things you can look forward to..
One of the first questions that you ask is why does this sharpener work so effectively where others seem to fall short? The Priority Chef knife sharpener has a 2 stage sharpening wheel system. Stage 1 is a diamond coated sharpening wheel for coarse sharpening and stage 2 is a ceramic sharpening wheel for fine sharpening and honing of your blade. The diamond wheels sharpen simultaneously "into" and "out of" the knife edge. Perhaps this attention to detail and using a diamond wheel is what separates us from all the other competitors! So get your's now by clicking add to cart above, consider purchasing two sharpeners, one would be an excellent gift when you need it!! FeaturesTHE PROFESSIONAL CHEF'S PREFERRED CHOICE. Forget the other sharpeners. If you're looking for a high-quality, reliable sharpening tool, this is the best system in the market today. This product will keep any straight edge steel knives constantly sharp. Your kitchen shouldn't be without it!STYLISH, ERGONOMIC DESIGN AND DURABLE CONSTRUCTION. With its 2-stage sharpening system, you can polish your blades to razor-sharpness. This product is also designed for comfort. The non-slip cushion at its bottom offers a more stable base while its ergonomic handle provides a comfortable, easy grip. It's the perfect complement in most kitchens!SAFE, VERSATILE, AND EASY-TO-USE. This product is easy to use. Simply position the dull blade on the sharpening slot and enjoy razor-sharpness in just seconds. It's also safe to use and works for all types of blades, including high-quality, "hard" steel blades.BRING BACK DULL BLADES TO LIFE. Why spend more money buying a new blade set? With this product, you can recycle your old, dull stockpile and sharpen them back to life.